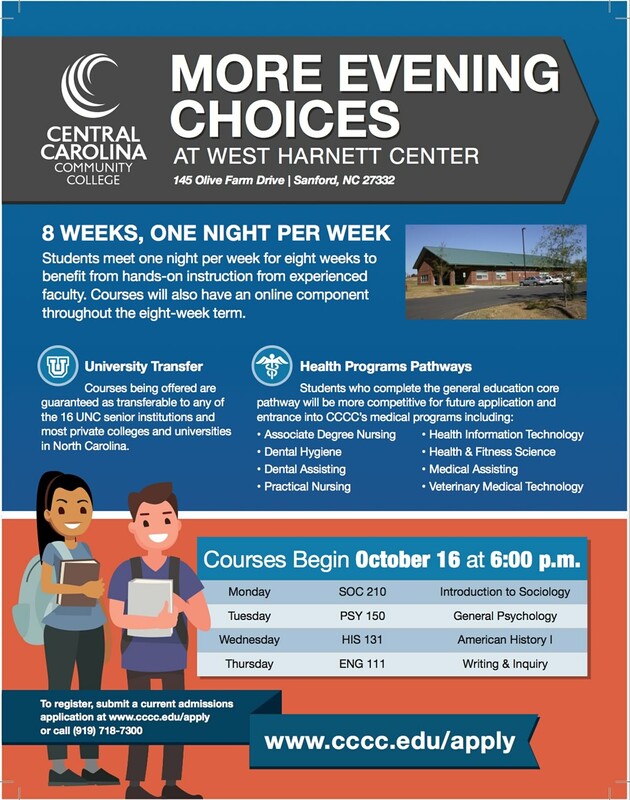 SANFORD - Central Carolina Community College will provide night courses at its West Harnett Center, beginning Oct. 16. The West Harnett Center is located at 145 Olive Farm Drive, Sanford. Students will meet one night per week for eight weeks to benefit from hands-on instruction from experienced faculty. Courses will also have an online component throughout the eight-week term. Courses offered with be Introduction to Sociology (SOC 210) on Mondays, General Psychology (PSY 150) on Tuesdays, American History I (HIS 131) on Wednesdays, and Writing & Inquiry (ENG 111) on Thursdays. Courses being offered are guaranteed as transferable to any of the 16 University of North Carolina senior institutions and most private colleges and universities in North Carolina. Also, students who complete the general education core pathway will be more competitive for future application and entrance into CCCC's medical programs. To register, submit a current admissions application at www.cccc.edu/apply or call (919) 718-7300.